It is time to negate fear and worry from our lives—please read the previous post on this subject. There is nothing good about fear. Fear will stop the Blessing of God from taking place in our lives. When we give over to the element of fear, we give ourselves over to things we really do not want to come to pass. Your love and service for God does not remove the fact that fear will open the door for a lot of unwelcome things in our lives. This is truly what happened in the life of Job. In the verse above, Job explains his state of mind when he was giving sacrifices for his children’s sin. He was in a state of fear in the midst of being loyal to God. Although Job loved God and served Him, his fear opened the door for Satan to have free course to destroy his family and livelihood. Death and destruction; sickness and disease; poverty and lack; are all elements of the curse and are not ever given to us by God. Nevertheless whenever we leave God’s protection by fearing instead of connecting to it through faith, we leave ourselves unprotected. God wants us to walk in faith and not fear. Faith connects us to the goodness of God and everything He desires for us to have in our lives. Faith in God and His Word is the foundation for every Believer. When we live a life of faith, we express our trust in God to be everything we need to sustain us. Conversely, when we are in constant fear of ‘bad’ things happening in our lives, we empower those very things to come to pass. 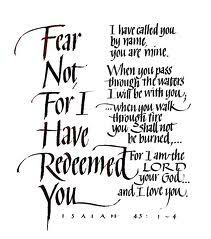 It is the will of God that we experience His best but we hinder that when fear is allowed to go unchecked. Therefore, whenever you find yourself embracing fear rather than faith; turn to the Word, begin to focus on faith and root fear out—you will be better for it. So, make the decision today to eradicate ALL fear from your life. Father, we recognize that fear does not come from you. Therefore, we denounce fear and its power from our lives now. We make the choice to turn to faith in you and make the choice to walk in and live by that faith. Thank you for the power to make this change, in Jesus’ Name…Amen! You’re welcome! Yes, God knows what we need and when we need it! Bless you! There is no greater fear than panic attacks. I have experienced that demonic force twenty years ago. I had just called my doctor and told him I thought I was going to die. I laid down on my bed and I felt a warmth coursing through my body. I believe that was the touch of God and He healed me from that insanity. It was not even something that I had taken to Him in prayer, I was too crazy to pray logically. It was His gift to me and it is only one of the many fabulous gifts he has bestowed upon me. Thank you so much for attacking fear straight on. It is a tool of Satan and is ruthless against God’s purpose and will. You’re welcome Gracie and thank you for sharing your heart in this response! It is my desire to expose the working of the enemy in this matter! Blessings to you! Right back at you with those blessings sir. 🙂 Have a glorious day in the presence of the Lord. So very true. I once was given over to fear. It was so choking upon my spirit, it became difficult to do things for the Lord. I discovered, that my “fear” was really a deep seeded root of un-belief. In my innermost being, I didn’t really believe that God could protect me, deliver me, heal me and empower me. I am so glad that time in my life has passed. I now have such a better grasp on who God is and what He wants to do in me and through me. I loved the reminder in this post. Great Job and Spirit Led! Wow, what a testimony! Your comment really speaks to the heart of what I want to say on this subject. Thank you for sharing. Blessings! Absolutely my pleasure to do so my friend. You’re so very welcome! Blessings!